Leadership and sustainability have separately been the subject of numerous studies in a built environment context over the years, but they have yet to be addressed together. The real impact of legislation and guidelines designed to promote sustainability within the construction industry is closely linked to the leadership behind it, as this book explores in a variety of ways. Featuring research from 5 different continents, the international scope of this book allows a comparison of experiences in different types of economies and cultures. The interdisciplinarity of this subject is also reflected in the backgrounds of the contributors, with a significant number of perspectives derived from business and management research. 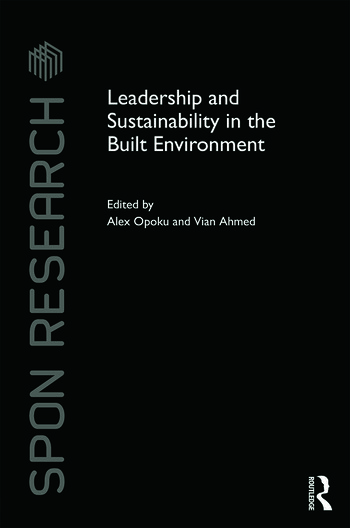 The issues examined in this book are essential reading for all researchers, decision-makers and graduate students in the built environment. Alex Opoku recently took up a position as a senior lecturer in quantity surveying at London South Bank University, having previously conducted research in the Department of Engineering at Cambridge University. Vian Ahmed is a professor and director of postgraduate research studies at the Built Environment department of the University of Salford.